^ 2.0 2.1 M.A. Lombardi, T.P. Heavner, S.R. Jefferts. NIST Primary Frequency Standards and the Realization of the SI Second (PDF). Journal of Measurement Science. 2007, 2 (4): 74. ^ William L. Laurence, "'Cosmic pendulum' for clock planned," New York Times, 21 January 1945, page 34. Reprinted on page 77 of: Lombardi, Michael A.; Heavner, Thomas P.; and Jefferts, Steven R. (December 2007) "NIST primary frequency standards and the realization of the SI second," NCSLI Measure, vol. 2, no. 4, pages 74-89. ^ D.B. Sullivan. Time and frequency measurement at NIST: The first 100 years (PDF). 2001 IEEE International Frequency Control Symposium. 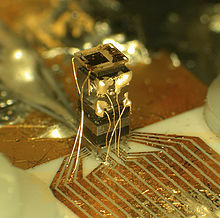 NIST: 4–17. 2001. （原始内容 (PDF)存档于2011-09-27）. ^ W. Markowitz, R.G. Hall, L. Essen, J.V.L. Parry. Frequency of cesium in terms of ephemeris time. Physical Review Letters. 1958, 1: 105–107. Bibcode:1958PhRvL...1..105M. doi:10.1103/PhysRevLett.1.105. ^ 相对论已经被证实是正确的吗？ - 知乎. www.zhihu.com. [2018-04-27] （中文）. ^ 网站防火墙. www.chinadmd.com. [2018-04-27]. （原始内容存档于2018-06-12）. 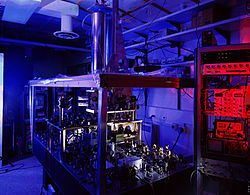 ^ 12.0 12.1 SA.45s CSAC Chip Scale Atomic Clock (PDF). 2011 [12 June 2013]. S.R. Jefferts, T.P. Heavner, T.E. Parker and J.H. Shirley (NIST Time and Frequency Division). NIST Cesium Fountains − Current Status and Future Prospects (PDF). Acta Physica Polonica A. 2007, 112 (5): 759 ff. Bibcode:2007AcPPA.112..759J.